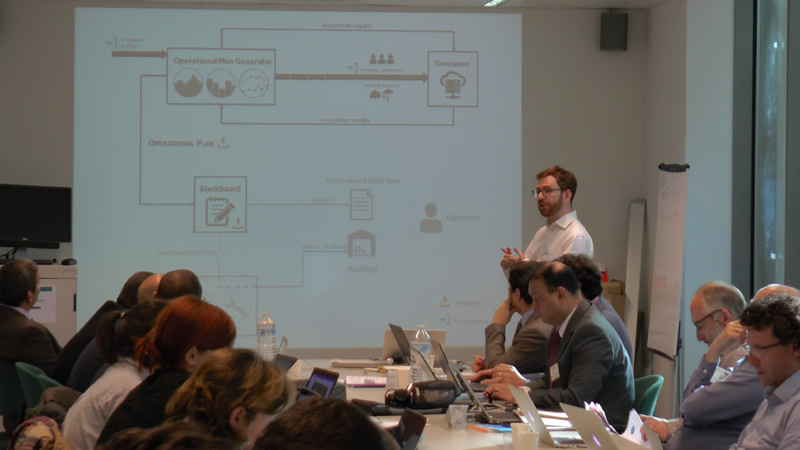 The Energy in Time Project faced the second review meeting on November, 10th, to show the outcomes achieved during the last eighteen months up to September, 31st . The presentations conveyed by each partner of the EiT Consortium were done in the CDMA Building of the European Commission in Brussels centering on the exploitable results rather than on the work packages. 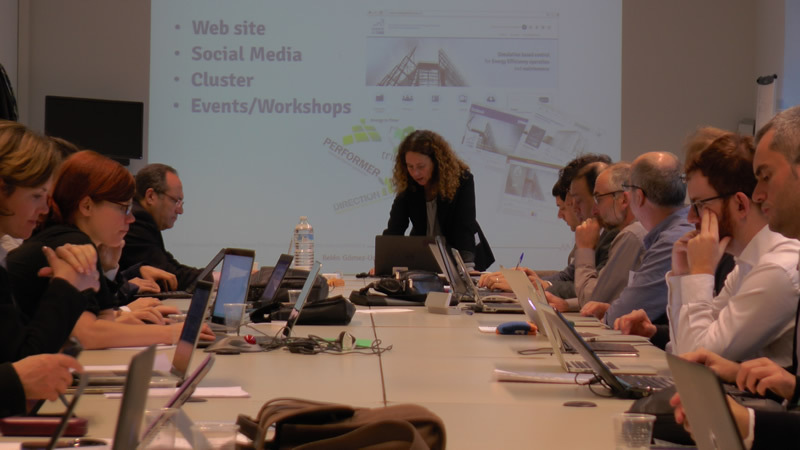 The Communication Platform was developed at the beginning of the project, so at the meeting the attention was focused on the test site connection, especially at Faro airport, Portugal, one of the four deployed pilots under this project. This is the most complex site which allows us to explore and understand multiple aspects and develop different strategies for a proper data collection (OPC, specifically designed connectors for proprietary systems protocols) and transmission to the EiT aggregator in cloud ensuring the necessary security for access and data management. Other three pilot sites are different from the Portuguese airport due to their own characteristics (old vs. new buildings), business reasons (the way the Direction controls from their own BMS systems and a parallel existence of the EiT control and monitoring system) and geographic and climate zones (Finland, Romania and Italy). The pilot sites require a constant adaptation to prove the results on an improved scientific basis to guarantee refined results and provide results for the building areas non covered by the EiT simulator. This includes such actions as site configuration, recalculation of the OPG (optimal plan generator) when significant differences in the current weather conditions are detected, adopt incremental approach MOD+OPG, and collaboration with the operators who work in the building. The tests done on the developed models, such as Simulation Model, MODC, Continuous Commissioning Model, Fault Detection and Diagnostics, Decision support tool, Centralized remote control – all of them in continuous calibration – evidenced that through the EiT system, the users can achieve an important energy consumption reduction – a minimum of 20% as per the latest results – and significant improvements like air control optimization in a restaurant area of the hotel which is one of the EiT pilot sites. The EIT system is relied on the most efficient technological advances, for example, a real time self-learning controller which includes smart metering, and real-time fault detection. Data mining is another technique through which it is possible to correlate all the variables in a very efficient way and understand better energy consumption trends. The result is the useful information which states a value-added value to the project. In addition, life demo were done to show the design and organization of each model included in the EiT system and the visible results for the user such as data in real time, analysis presented in graphs and tables reporting historical aggregated data. A particular feature of the EiT project is that it takes into account different types of buildings of different ages and located in different places with particular weather conditions. The EiT system is also integrable with other systems such as booking platform at hotels or flights schedule at airports. The main target for any kind of building is that energy consumption efficiency must be aligned with the indoor conditions to provide comfortable environment to the building users. And this is what is achieved through the Energy in Time system. The Consortium members concluded during this meeting that there are real results at this point and from now on they must potentiate dissemination that can be carried out through participation in conferences and events focused on solutions for energy-efficient buildings, cooperation with other projects and institutions increasing cluster work and publishing articles in different journals, platforms and so on. As a promotional material, the EiT Consortium agreed to prepare short videos with demo and interviews with the EiT members who will explain key points of the system to generate interest of future investors. This material will be completed with renewed printed material such as posters and flyers. Finally, exploitation plan was presented to the Commission stressing the management aspects and fixing the plan for the next period.